The first roulette wheel was created accidentally by Blaise Pascal inspired by the idea of inventing of a perpetual motion machine. Since that time it has been modified until the wheel appeared that we know nowadays. According to one version the roulette derived from an English game E-O and Italian Hoca game. The principle of these games was the same. They played with the help of a specially marked wheel which indicated the winning bets. The game E-O had also even and odd that remained up to now. The roulette wheel may slightly vary in different roulette games. Roulette wheel's construction is rather easy. 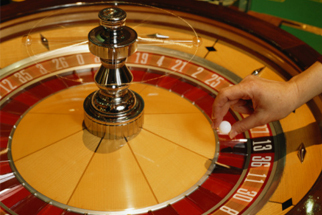 It is a rotating wheel with a special design that is placed on the roulette table. The numbers up to 36 are placed among red and black, big and small, even and odd. There are also extra 0 slot and 00 slot in American Roulette. The ball lands into special pockets near the numbers. There are two main parts of the wheel construction: bowl and wheel head. The bowl includes a spindle, the lower ball track with the ball deflectors and the ball track. The wheel head is placed on the ball and fits with the lower and upper ball tracks. The outer edge includes pockets for the ball and colored numbers. Nowadays the ball is made from nylon, phenolic or acetal but firstly they were produced of ivory bone. The material influence on the speed of the ball's rolling, which is important for the gamblers. The roulette ball should be 12/16-inch diameter this assures the proper speed of revolving and landing. Some roulette wheels have a lip under the apron. The absence of the lip in modern roulette wheel almost excepts the chances of predicting the results. The possibility of ball's landing on the even or odd, red or black is equal.